325 pp. Penguin Books. $16.00. I forget why I missed book club, but for whatever reason, I wasn’t there when this book was chosen as our June book. When I got the email saying this was our next book, I was a little less than thrilled. It’s not that I thought I’d hate it. It’s that the description on the back of the book makes it sound like it’s going to be similar to Bridget Jones’s Diary, but boring. 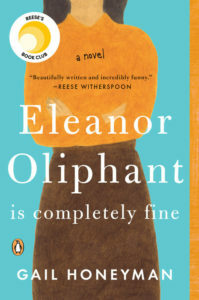 It makes Eleanor’s biggest problem sound like it’s her lacks social skills, not the damaged past, when the mystery of her past the biggest reason to read the novel. It wasn’t until I saw the quote inside the book, “Move over, Ove. There’s a new curmudgeon to love,” that my interest was piqued. I bought the book and read it in a few days. Just like that book, the interaction with other people causes funny scenes, but there’s meat to the story beyond the surface grumpiness. Told in a funny way, this book cuts deep. Sure we laugh out loud when Eleanor decides to start paying attention to her appearance and decides to get a bikini wax. When asked by the salon technician what kind she wants, she ends up with the Hollywood because she’s afraid to ask what’s what. A verbal assault takes place which is both cringe worthy and hysterical. The story follows Eleanor after she meets the love of her life and decides to start making changes, like the aforementioned bikini wax. After years of being stuck in a shell, she ventures out into new terrain. Accompanying her on this journey is lovable Raymond, the new IT guy, who offers her friendship, acceptance, and a nudge to do better. During Eleanor’s new adventures, she slowly comes to a point where she has to face her past. A past that is heartbreaking in the fact that so many people let her down. Knowing her past, she really is an Olympian. The book is vividly written. It’s funny, sad and uplifting. And for a book that looked like a beach read, it had a surprising about of love and depth, leaving me wanting to be a better person, reminding me that every person has a past. Every person brings that past with them, influencing part of their personality. Not knowing what that past is, maybe we should let up on the judging and give a little more compassion. Eleanor Oliphant is Completely Fine is a must read. My book club loved it so much, they were still talking about it at our July meeting. I’m looking forward to seeing how the movie holds up.